Seamus Finnigan: "How did he get covered in blood?" Nicholas de Mimsy-Porpington: "I've never asked." The Bloody Baron (late 10th century – early 11th century) was a wizard who attended Hogwarts School of Witchcraft and Wizardry in the Founders' time and was Sorted into Slytherin house. After Hogwarts, he fell in love with Helena Ravenclaw, but she did not love him. He was sent by Rowena Ravenclaw to find Helena in Albania, but Helena refused to return with him and so he killed her in a rage. When he realised what he had done, the Baron stabbed himself with the same knife and died. After death, he is one of the ghosts that haunts Hogwarts School of Witchcraft and Wizardry, and the ghost of Slytherin house. Covered in Helena Ravenclaw's blood to this day, he earned himself the moniker of "Bloody Baron". The Baron was born into nobility, no earlier than 982. At the age of eleven, the Baron became part of one of the first generations of students at Hogwarts School of Witchcraft and Wizardry in Scotland, which, at that time, was still being run by its original Founders. He was Sorted into Slytherin House and was educated in the magical arts by Salazar Slytherin for the seven years that followed. Sometime around this time the Baron met Helena Ravenclaw, daughter of Rowena Ravenclaw, whom he fell in love with, though she always rejected his advances. Helena Ravenclaw: "He tracked me to the forest where I was hiding. When I refused to return with him, he became violent. The baron was always a hot-tempered man. Furious at my refusal, jealous of my freedom, he stabbed me." Harry Potter: "The Baron? You mean —?" Helena Ravenclaw: "The Bloody Baron, yes. When he saw what he had done, he was overcome with remorse. He took the weapon that had claimed my life, and used it to kill himself. All these centuries later, he wears his chains as an act of penitence… as he should." Later on in his life, Helena, after stealing a diadem belonging to her mother that increased the intelligence of the wearer, ran away to Albania. Around this same time, Rowena fell fatally ill, although legend has it that it was a broken heart, possibly caused by her daughter abandoning her. Rowena ordered the Baron to go after her, which he did, eventually finding her hiding in a forest. After he had found her, the Baron tried to compel her to return with him, but she refused, and, in a fit of rage, he killed her. Overcome with grief, he proceeded to take his own life with the same weapon he used to stab Helena. The Baron, as well as Helena, now known as the Grey Lady, both returned from the dead as ghosts, and returned to Hogwarts Castle, where they became the house ghosts of their former Houses, Slytherin and Ravenclaw respectively. The Baron has been remorseful of his actions ever since, and carries heavy chains as a sign of penance. Nobody else seems to know why he is covered in blood, not even the other Hogwarts ghosts, excluding the Grey Lady. For unspecified reasons, presumably related to his apparently violent, dangerous nature, the Baron has gained Peeves's respect and is the only one, besides Professor Dumbledore, who can give him orders. According to Nicholas de Mimsy-Porpington, groaning and clanking in the Astronomy Tower was a favourite pastime of the Baron's. On 1 September 1991, the Baron attended the Start-of-Term Feast, where he sat next to first year Draco Malfoy, who did not look too pleased with the seating arrangements. A while before midnight on 12 September 1991, the Bloody Baron passed twice by the Fat Lady's Corridor, frightening Neville Longbottom, who was sleeping in the corridor because he had forgotten the new password to get into Gryffindor Tower. Shortly prior the Hallowe'en feast on 31 October, the Baron haunted the Dungeons. In the evening of 4 June during their quest to save the Philosopher's Stone from Lord Voldemort, Harry Potter, Ronald Weasley, and Hermione Granger, all under the Cloak of Invisibility, were intercepted by Peeves who threatened to call Argus Filch if whoever that was there did not show themselves. Harry Potter, in a hoarse whisper, proceeded to impersonate the Baron. On the evening of 31 October 1992, the Baron attended Nicholas de Mimsy-Porpington's five-hundredth Deathday Party. The other ghosts appeared to avoid him during the celebration. He spent Christmas day strolling the dungeons by the Slytherin Dungeon. Harry Potter: "Why? What happened?" Later in the year, the Baron encountered Harry Potter and Ron Weasley in the North Tower, while they were talking about Sybill Trelawney's alleged predictions of Harry's death. Nicholas de Mimsy-Porpington: "I would not go that way if I were you. Peeves is planning an amusing joke on the next person to pass the bust of Paracelsus halfway down the corridor." Harry Potter: "Does it involve Paracelsus falling on top of the person's head?" Nicholas de Mimsy-Porpington: "Funnily enough, it does. Subtlety has never been Peeves's strong point. I'm off to try and find the Bloody Baron… he might be able to put a stop to it… see you, Harry." By 1995, there was a tetraptych of the Baron hung in the dungeon cupboard. He would frequently haunt this area of the Dungeons during this school year. During the Start-of-Term Feast, on 1 September 1995, Ronald Weasley managed to inadvertedly insult Nicholas de Mimsy-Porpington, by saying the ghost was afraid of the Bloody Baron when he said he would never dream of seeking an argument with the Baron. A week later, on 7 September, Nicholas de Mimsy-Porpington looked for the Baron to see if he could dissuade Peeves from dropping a bust of Paracelsus on top of anyone who passed the corridor in which the bust stood. Nicholas de Mimsy-Porpington: "He is here. Professor Dumbledore returned to the school an hour ago. I had it from the Bloody Baron, who saw him arrive. He appeared, according to the Baron, to be in good spirits, though a little tired, of course." Harry Potter: "Where is he?" Nicholas de Mimsy-Porpington: "Oh, groaning and clanking up on the Astronomy Tower, it's a favourite pastime of his —"
In the early hours of 22 April, 1997, the Bloody Baron saw Albus Dumbledore return to the Castle from one of his missions to find Lord Voldemort's Horcruxes, and reported it to Nicholas de Mimsy-Porpington. He later retreated to the Astronomy Tower where he liked to groan and clank. On 2 May, 1998, the Battle of Hogwarts ensued after Lord Voldemort learned Harry Potter was in the premises. The ghosts, likely including the Baron, attended a gathering in the Great Hall, in which Professor McGonagall gave instructions on evacuation of underage students and Kingsley Shacklebolt organised the participants for battle. Later on, the ghosts gathered at the Great Hall, joining the mass mourning over the dead. As a ghost, the Baron was very pale, pearly-white and slightly transparent. He had wide, staring, black eyes and a gaunt face. He dressed in robes covered in silver bloodstains, and carried chains in a final act of penitence for having murdered Helena Ravenclaw. He also sported a curly powdered wig and carried his sword. He spoke in a hoarse whisper. Nicholas de Mimsy-Porpington: "Well, now, you shouldn't take that attitude. Peaceful cooperation, that's the key. We ghosts, though we belong to separate houses, maintain links of friendship. In spite of the competitiveness between Gryffindor and Slytherin, I would never dream of seeking an argument with the Bloody Baron." Ronald Weasley: "Only because you're terrified of him." During his lifetime, the Baron was described by Helena Ravenclaw as a "hot-tempered man". He insisted on having his way in interactions, responding with violent uncontrolled anger when contradicted. As a ghost, he was frightening and most people did not seem to enjoy his presence, not even his fellow ghosts. However, he seemed to have a cordial, if not friendly, relationship with the ghost of Sir Nicholas de Mimsy Porpington, despite Ronald Weasley's allegations of the latter being "terrified" of him. The Baron seemed to be intolerant towards Peeves, who was scared of him, and could not bear his lack of civilisation, putting "his foot down" over the Poltergeist's presence in the 1994 Start-of-Term Feast. He also seems to have a great deal of House pride; before Harry Potter's arrival at Hogwarts, Slytherin had won the House Cup for six years in a row, and the Baron had become "unbearable" according to Nicholas de Mimsy-Porpington. In the Welsh translation, the Baron's name is given as Waldo. 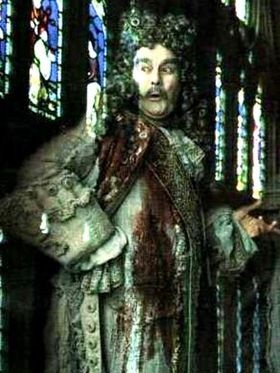 The Bloody Baron is the only Hogwarts house ghost in the books without any on-'screen' dialogue. In the film adaptation of Harry Potter and the Philosopher's Stone, the Bloody Baron is portrayed by Terence Bayler. In the films, the Baron is depicted as being quite mirthful, in stark contrast to the solemn and quite terrifying character in the books. In the video games, however, the Baron resumes his "book" persona. In all of his media appearances, the Bloody Baron appears in late seventeenth century attire. This wardrobe was chosen for the film adaptation of Harry Potter and the Philosopher's Stone, when the Baron's death date was uncertain. This, of course, is not consistent with Harry Potter and the Deathly Hallows, in which he is revealed to have died in the early eleventh century. His epithet, the Bloody Baron, is also an anachronism, as feudalism was not introduced in the British Isles until after the Norman conquest in 1066, and therefore there were no barons until this time. In the film adaptation of Harry Potter and the Philosopher's Stone, the Bloody Baron resembles Captain James Hook (as played by Dustin Hoffman) in the film Hook. Coincidentally, that film features Maggie Smith, who plays Professor McGonagall, as well as a music score by John Williams. The Baron is encountered in the PC/64 version of Philosopher's Stone walking the labyrinthine dungeon corridors where Professor Snape sends Harry Potter to find four crucial potion ingredients. In the next gen version of Chamber of Secrets, the Baron can be seen walking the path from the dungeons through the entrance hall to the teacher's lounge corridor, every night, the chilling sound of his footsteps echoing through the hall each time as he approaches. In the credits of the film adaptation of Harry Potter and the Philosopher's Stone, his name is misspelt as "Bloody Barron". In the PS2 version of the video game adaptation of Harry Potter and the Prisoner of Azkaban, there is a large statue of the Bloody Baron on the North Wing. ↑ 1.0 1.1 Given Hogwarts was founded in around 993 A.D. and that the Baron attended it within Rowena Ravenclaw's lifetime, he must have been eleven by or after the school's founding. So, the earliest date he could have possibly been born is 982. ↑ He killed himself after his seven years at Hogwarts, and given the earliest he could have started at the school is 993, his earliest possible death year is 1000. This page was last edited on 6 July 2015, at 11:17. This text is available under the GNU FDL and may have been adapted from the Wikipedia article about Bloody Baron (history).